Checkbox has a range of survey and folder permissions settings that allow you to restrict access for both respondents (survey takers) and admin users. This document walks you through the process of configuring user and response permissions for Checkbox surveys and folders. 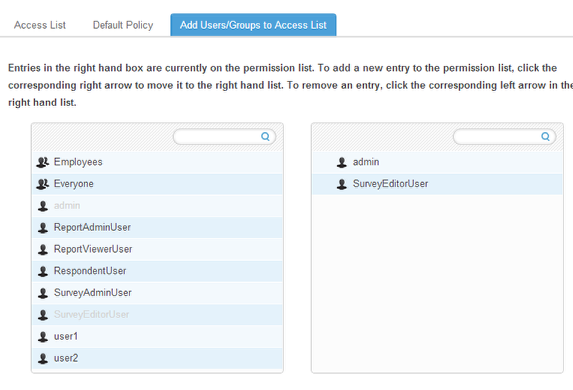 Survey permissions are configured within the Survey Editor under the Permissions & security tab of the Configure menu. NOTE: Privacy level can also be configured within the Launch Wizard. Setting a survey to Public means anyone who has your survey link may take your survey and all responses will be anonymous. Public surveys are most useful when you need summary survey results and don’t need to link responses to respondents. Setting a survey to Password Protected means any respondent that knows the password may complete this survey. Respondents must enter the password you assign below to take the survey. All responses will be anonymous. This is similar to a public survey, but the password adds an extra layer of security. An Access List is a list of registered Checkbox users that you create for a certain survey. Only the users and user groups you add to the Access List will be able to take the survey. Users must login to Checkbox to take the survey (or must be auto-logged in through a Checkbox email invitation) and their responses will be linked to their user names. Access List surveys are most useful when you only want specific users to take your survey. Setting the Privacy Level of a survey to All Registered Users means that anyone with a Checkbox username and password will be able to take your survey. Users must login to Checkbox to take the survey (or must be auto-logged in through a Checkbox email invitation) and their responses will be linked to their user names. This setting is most useful when you want to give all your users access to a survey or when you are using Checkbox’s self-registration feature to manage access to a survey. Setting a survey to Invitation Only means that only respondents who receive a Checkbox email invitation will be able to take the survey. Invitations can be sent to registered Checkbox users/user groups or to email addresses/email lists. Responses will be tied to those users or emails. This setting is most useful for tracking response rates and sending reminders. NOTE: The survey links in Checkbox email invitations are unique to each user or email recipient and are not meant to be shared. Allow Return to Previous Page: When enabled, a “Back” button will appear with the survey’s navigation buttons allowing respondents to move backward in a survey and review/modify responses prior to survey submission. NOTE: Using the browser back button to return to a previous page is not supported and can cause data issues. If you want your respondents to be able to navigate backwards in your survey, you should enable the survey back button. 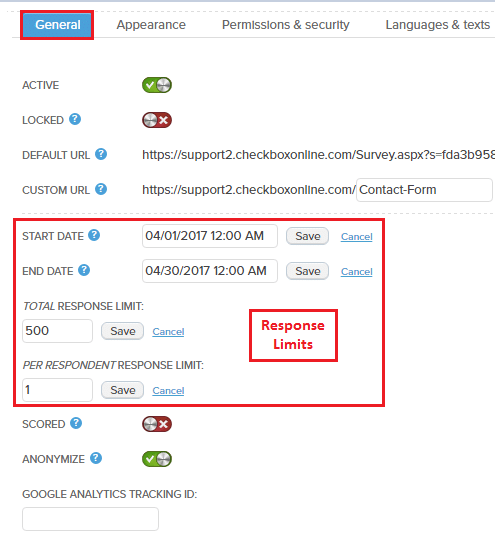 Allow Response Reset: When enabled, a “Form Reset” button will appear with the survey’s navigation buttons allowing respondents to clear all responses on that survey page. 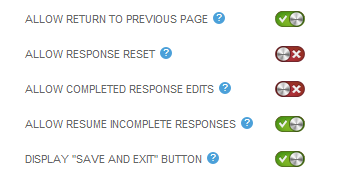 Allow Completed Response Edits: When enabled, respondents have the ability to return to a previously submitted survey and modify their completed response. Allow Resume Incomplete Responses: When enabled, respondents can stop their survey at any point and resume it at a later date, while saving all previous responses. Display “Save and Exit” Button: When enabled, a “Save and Exit” button will appear with the survey’s navigation buttons, allowing respondents to save their partially completed answers and resume them at a later date. They can either copy and paste the resume link or email it to themselves. NOTE: This option is only available when “Allow Resume Incomplete Responses” is enabled. Response Start/End Date: Time-frame within which responses can be collected for a survey. If a respondent attempts to take the survey outside of the dates specified, they will be shown a message indicating that the survey is not currently collecting responses. NOTE: Survey must be active prior to Start Date. Total Response Limit Number of responses that can be submitted before survey closes to responses. If a respondent attempts to take the survey after the response limit is reached, they will be shown a message indicating that the survey is not currently collecting responses. Per Respondent Response Limit: Number of responses that can be submitted by a unique respondent. NOTE: Survey respondents must be known in order for this limit to be enforced, so this limit cannot be used with Public or Password Protected surveys. A survey’s Privacy level controls survey access for Respondents only. 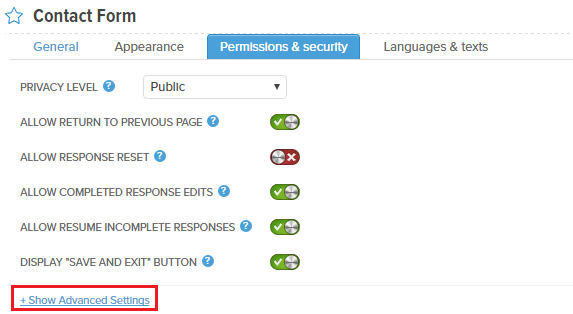 These security options do not configure any permissions for admin users in charge of creating/editing/administering surveys, such as Survey Editors and Survey Administrators. 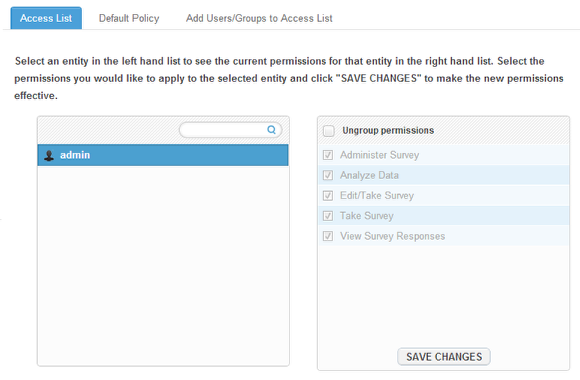 Under Permissions -> Advanced Settings is an Access Control List (ACL) that allows you to share access to your survey with other admin users so they can review, edit and collaborate on your survey. NOTE: In order to share admin access with another user, that user must first have the proper user role assigned to his/her profile (i.e. giving a Respondent access to edit a survey won’t actually do anything because the Respondent user role only allows for survey taking). For more information on user roles, click here. When you open the ACL, you will see the Access List tab, which displays the list of users who already have access to your survey. Clicking on the username (left hand panel) will show you what level of access they have (right hand panel). NOTE: System Administrators and the survey owner have all permissions enabled by default and their permissions cannot be modified. 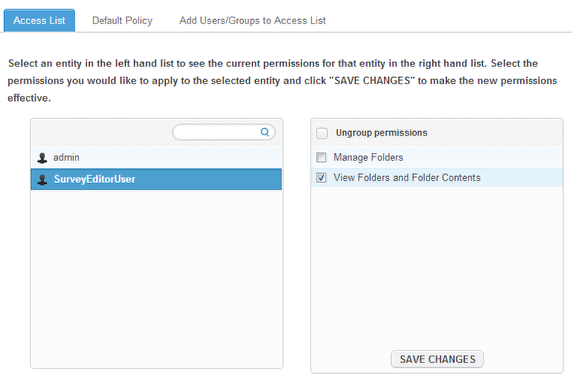 To add a user/group to the ACL, move to the Add Users/Groups to Access List tab. In this view entries on the right are already included on the permission list. 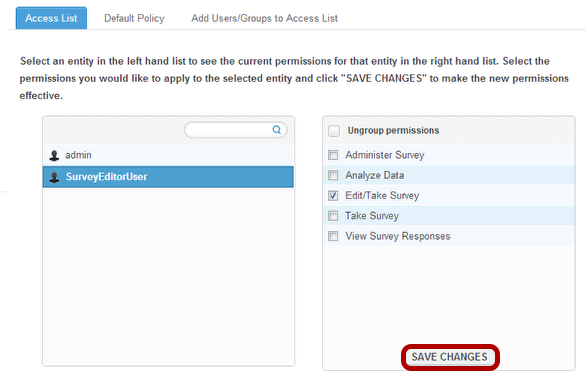 Users/groups on the left can be added to the ACL by clicking the desired entry. The entry will then move to the right-hand box. 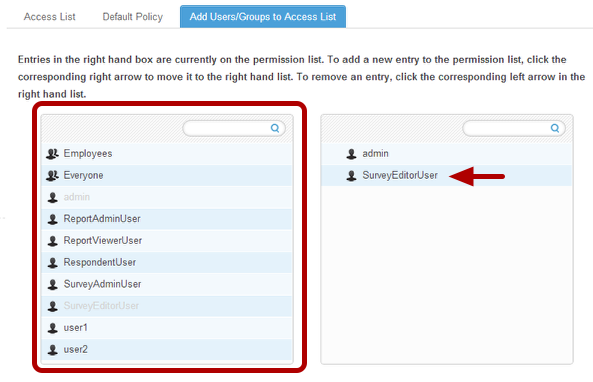 Once you add the desired users to the ACL, return to the Access List tab to configure their permissions. Select the newly added user to reveal a list of permission options on the right. Select desired permission(s), making sure that the permission level you select corresponds with the user’s designated user role(s). After configuring the user’s permission level, select Save Changes. 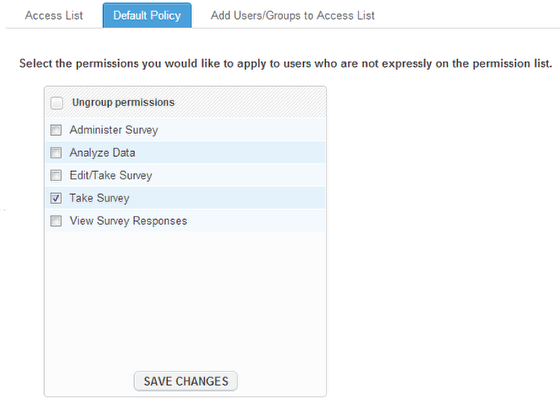 A survey’s default policy is the permission setting for all users not included on the survey’s ACL. It’s also the easiest way to make your survey public. For example, if you granted specific users permission to administer a survey on the Access List tab, but you want anyone not specified on the ACL to still be able to respond to the survey, set the default policy to “Take Survey” (this is the same as setting the survey’s privacy level to “Public”, because it means that anyone with the survey URL can take the survey). NOTE: If there is a conflict between the Access List and the Default Policy, ACL permissions will supersede the Default Policy. Every survey folder within Checkbox contains its own access control list (ACL). In order to give a user access to a survey that is stored within a folder, you must also give that user access to view the folder. NOTE: Folder permissions do not propagate to the surveys within that folder, i.e. you must grant access to both the folder and the survey. To change a folder’s permissions, from the Survey Manager, find the folder you wish to configure, expand the settings/cog icon, and select Permissions. Move to the Add Users/Groups to Access List tab and add desired user(s). 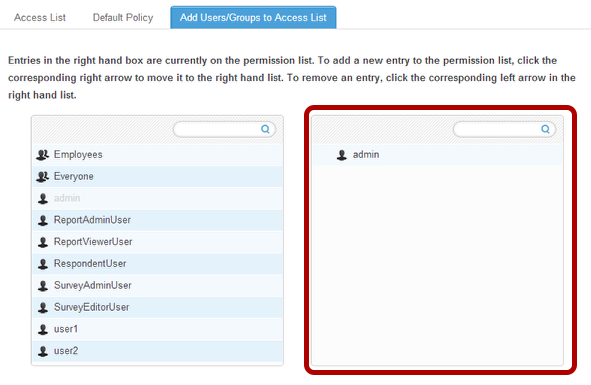 Move to the Access List tab and select the newly added users to expand permissions. Select “View Folders and Folder Contents” permission options.